The snows have begun to melt at the South Pole, and it’s time for the penguins to go out fishing. But it’s not all that easy to dive into the icy waters, and you don’t get the fish that easy either! 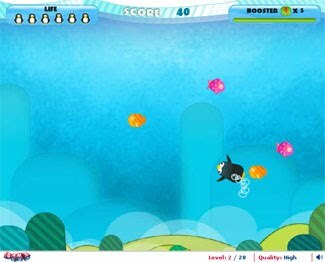 Penguin Plunge is a simple game that gives you a glimpse of underwater fishing. Press space bar to plunge into the water, and ‘left’ and ‘right’ arrow keys to navigate. Avoid sharks, octopuses and arrows. Press space bar to activate booster once under water. If the penguin floats, it means a life is lost. Win a ‘Deep-sea Diver’ Medal for scoring 1500 points!